Give the gift of adventure this year with a South Carolina state parks gift card! Our gift cards can be used for making reservations for campsites, rental cabins, picnic shelters and meeting facilities at state parks throughout South Carolina. 803.734.0156 or purchase them at a state park near you. Cards will be sold only at parks that include amenities that can be reserved, such as campsites, cabins, shelters, meeting facilities, etc. Cards must be purchased in-person at a park and cannot be purchased via phone except by calling the parks central ofﬁce at 803.734.0156. The gift card can be used to make a payment/reservation over the phone, via the website or at any park location accepting the card as payment. 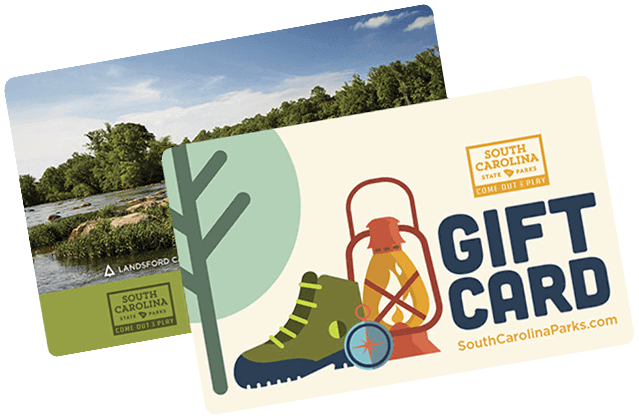 All gift card revenue is used to support the operations and maintenance of South Carolina's 47 state parks. We are delighted to bring you these gift cards and hope you keep them in mind when purchasing a gift for that special someone or for yourself! For other park-related retail items (not including gift cards), please visit our online park store.